I'm detecting a slightly more sceptical tone in this newest book by Brian Haughton. "History's Mysteries" looks at a selection of historic puzzles, many of which have built up myths around them, where accepted history cannot yet offer definitive answers. Each subject is covered by a chapter of about 6 pages. Within each chapter is a concise and well written summary of the relevant known facts, an overview of the controversial issues, the archaeological efforts being brought to bear to answer the outstanding questions (where applicable), and a short conclusion by the author. More often than not, Haughton falls into line with conventional explanations for various mysteries, although he does give a balanced summation of the various solutions offered by professional and amateur historians and archaeologists alike. The book thus becomes a rather quirky encyclopaedia. The books is intelligently collated, well-researched and objective. A project such as this runs the risk of becoming a Google or Wikipedia-sourced book, but Haughton has managed to keep the text very personal. His brand of writing is maintained throughout, which is good because he writes well. It's a shame he didn't proof-read the text quite as well, though - there are numerous ghost words left in the text where he has re-phrased sentences and not checked them afterwards. He would then also have spotted the sentence that simultaneously contains both Imperial and metric measurements on page 146. But these issues do not alter the enjoyment of the knowledge imparted - it just stands out for a book reviewer. His discussion of the volcanic eruption at Thera, Greece, also opens the question of a need to alter ancient chronologies, as mooted by previous controversial writers like Velikovsky and Rohl. So, this is by no means a completely conventional text. My regular readers would enjoy the chapter on the Tower of Babel, which contains quite a lot of information on Mesopotamian Ziggurats. There are other similar chapters on the Mound Builders of North America, the step pyramid at Saqqara in Egypt, and Tenochtitlan which lies under modern Mexico City. But, curiously, nothing about the Great Pyramid. This is an essential point about the book, I think. It is characterised not so much by what's contained within, but what is not. The really commonly-discussed mysteries are avoided in exchange for lesser known puzzles. So, the mysteries surrounding Cleopatra are explored instead of, say, Akhenaten. I think that this makes this book a rather special read - although I would have liked to have read about Homo Floresiensis in the same manner that Haughton tackled the Neanderthals. "History's Mysteries" is a useful reference to dip into (with an extensive bibliography for further reading) as well as an enjoyable read in its own right. Although, as a "30 Rock" fan, I can't help but put the title into the same category as the "rural juror"! 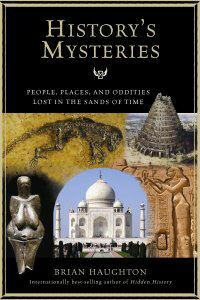 Subtitled "People, Places, and Oddities Lost in the Sands of Time."